Scotch eggs are a classic British picnic snack, traditionally made from a hard-boiled egg wrapped in sausage meat, which is then crumbed and deep-fried. 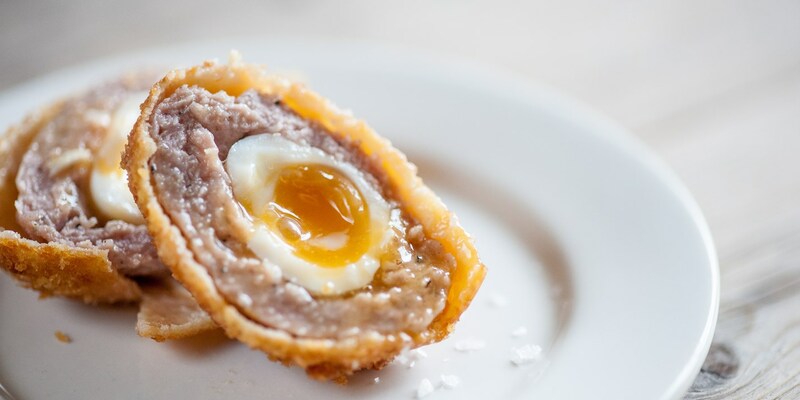 Chefs are now embracing the possibilities of the humble Scotch egg, replacing the traditional sausage meat with all manner of delicious fillings. Browse our collection for Scotch egg inspiration, from Richard Corrigan's smoked cod Scotch egg, to James Mackenzie's smoked mackerel Scotch egg. For something a bit more meaty, try James Sommerin's heavenly quail Scotch eggs. For more top tips on making classic Scotch eggs, visit our how to make Scotch eggs article.